This new disc from EM Records (the recording arm of the English Music Festival) brings together a pair of symphonic works by composers who are hardly household names, Percy Sherwood and Frederick Hymen Cowen, an example of how English music history still has many items to disgorge. 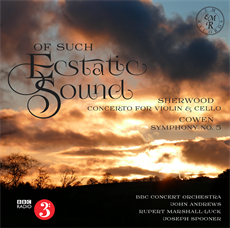 On this disc we hear Percy Sherwood's Concerto for Violin, Cello and Orchestra, and Frederick Hymen Cowen's Symphony No. 5 in F minor, performed by Rupert Marshall-Luck (violin), Joseph Spooner (cello) and the BBC Concert Orchestra, conducted by John Andrews. It is not that long ago when people might have decried that an English symphonic tradition existed in the 19th century. Concert programmes still seem to start with the symphonies of Elgar, though those of Stanford and Parry are becoming better known. But music by their contemporaries remains something of an unknown quantity still, it is not so much that there wasn't a tradition as that it has been forgotten by history. Now records like this are enabling us to explore. Percy Sherwood was a name entirely new to me. He was born in Germany, to an English father and a German mother. He studied at the Dresden Conservatoire with Felix Draeske and Bertrand Roth, both composers in the circle of Liszt, whilst another of his teachers, Theodor Kirchner was very much in the Brahms, Robert & Clara Schumann circle. Sherwood became a leading light of the music scene in Dresden until the First World War when he and his wife moved to England where Sherwood earned a living by teaching. Though he continued to compose his Germanic influence style was not in favour in England. His Concerto for Violin, Cello and Orchestra was written in 1908 at the height of Sherwood's career in Germany. Listened to blind, it is a fascinating piece as it is quite difficult to pin down the sound world. It is very much on the Brahms/Parry axis and the double concerto format raises ideas of Brahms' concerto for the same forces, and Sherwood does not attempt to deny the links and whilst elements of the opening movement are Brahmsian, the final movement positively revels in a soundworld similar to Brahms' concerto. Though the comparison only goes so far, Sherwood's harmonic sound-world is different to that of Brahms, and Sherwood's writing for the soloists keeps them firmly together almost as a unity without Brahms' sense of dialogue. Other composers you can pick up are Tchaikovsky, and the way Sherwood writes for orchestra often hints a light music side to his character (it would be interesting to hear some of his smaller pieces). You think that it does not sound like German models, but here again, we are in danger of hiding other paths through history. Simon Callaghan's recent disc on Hyperion's Romantic Piano Concerto series pairs together concertos by Rheinberger and Scholz [see my review] which give us an idea of the sort of musical backgrounds which Sherwood might have had. The work is in three movements, the first is graceful and melodic, very much an extended duet for violin and cello. The second movement is full of lyrical melancholy, with the soloists to the fore and only light orchestral support. The final movement is outdoorsy Brahms, and as I have said here Sherwood really does release his inner Brahms. Frederick Cowen was a name known to me, though I was hardly familiar with his music until I came across this disc. Born in Jamaica, he originally studied in London with Julius Benedict and John Goss before going to Leipzig where he studied composition with Carl Reinecke (another member of the Brahms/Schumann circle, Stanford was also one of his pupils). Forced home by the Austro-Prussian War, he forged a career for himself as composer and conductor, writing six symphonies, four operas and four operettas, as well as lighter music. His Symphony No. 3 was one of the most widely performed English symphonies until Elgar's symphonies came along. Cowen's Symphony No. 5 was written for the Cambridge Musical Society which premiered it in 1887 with Cowen conducting. The first movement Molto sostenuto e maestoso – Allegro, poco tranquillo starts out as a very grand introduction with much drama, yet as the movement develops it feels more like the prelude to something than the main event itself, promising to go somewhere yet never quite getting there. It is a large scale piece, nearly 15 minutes, and admirably avoiding convention though inevitably the spirit of Brahms hovers. The second movement, Allegretto, quasi allegro is delicate, dance-like and delightful, with the spirit of Mendelssohn not far off. In the third movement, Adagio molto sostenuto we have a long-breathed romantic melody which is almost Elgar-like nobilmente and in the vigorous final movement the spirit of Elgar does seem to bring inspiration. Cellist Joseph Spooner has already recorded Percy Sherwood's complete works for cello and piano on Toccata Classics, whilst pianist Hiroaki Takenouchi with the Royal Scottish National Symphony Orchestra and conductor Martin Yates has recorded Sherwood's Piano Concerto No. 2, dating from 1932-33, on Dutton Epoch. There is surprisingly little Cowen in the recording catalogue, just a recording of the sixth symphony in a 10 CD box from the Royal Liverpool Philharmonic Orchester and certainly not enough to give us a full picture of the man. The performances here are much more than admirable, both soloists in the Sherwood revel in the composer's lyrical lines and the sheer Brahmsian melodism of the piece. John Andrews and the orchestra give strong and stylish performances, enjoying the music for what it is rather than trying to make it into something else. I certainly hope that EM Records might follow this disc up with more Cowen. There is much to enjoy here, and it helps shed light on forgotten corners of the English repertoire.